America is an American folk rock musical band, composed originally of members Gerry Beckley, Dewey Bunnell, and Dan Peek. The three members were barely past their teenage years when they became a musical sensation during 1972, scoring #1 hits and winning a Grammy for best new musical artist. 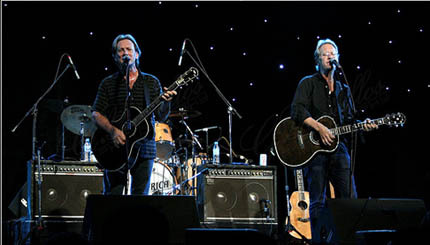 Their recording success was almost entirely throughout the 1970s; some of the band's best known songs are "A Horse with No Name", "Sister Golden Hair" (both of which reached #1), "Ventura Highway", "Tin Man", "Daisy Jane", and "Lonely People". Some of the band's singles and albums were successful commercially, and they attracted the services of The Beatles' producer, George Martin, for a series of seven albums. The band suffered a heavy blow when Dan Peek quit the group in 1977, right at its apex, but Beckley and Bunnell returned America to the top 10 as a duo with "You Can Do Magic" in 1982. Continuing to tour (for almost four decades now), America maintains a loyal fan base and performs over 100 shows per year. On January 16, 2007, America released Here & Now, the band's first major label studio album in over twenty years.